Lots of pigeons and doves in need of homes! 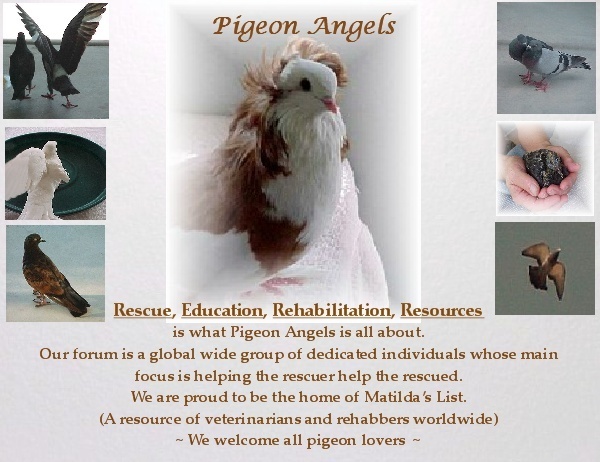 There are lots and lots of pigeons and doves in shelters all around Northern California and www.MickaCoo.org is so full that we're turning birds away. Or if you're going to be breeding pet pigeons and doves, think about saving a life (or two or six) that are already here and replace the real eggs with fake and adopt a homeless bird. MickaCoo has more than 20 doves available for adoption and almost 30 pigeons. Plus there are all the birds at the shelters... HELP! Until there are homes for all of them, don't buy, don't breed- adopt! Thank you Elizabeth. I can't agree with you more. This is a weird question maybe, but do you ship, I've already filled out my application thru mickaCoo and there are no shelters in this area according to the internet and petfinder. I really don't want to buy a pigeon when I can save a life. Subject: Re: Lots of pigeons and doves in need of homes!